Halloween can be a lot of fun. It’s even more fun when your pet can dress up and you two can walk around as team like Batman and Robin or a cowboy and a horse. You need to be sure that your pet will be ok being dressed up or else it could end up being a day where your pet is stressed and confused. If you’re going to buy a costume for your pet this year, make sure that your pet is ok wearing it. Some dogs and cats do not tolerate any type of material on their bodies and may fight to get it off. This can mean they will shred and chew the costume. They can also ingest pieces of it. If your pet is not the type that will tolerate a costume on them, it is best to not dress them up. If your pet seems grumpy or tired, dressing her up and making her go out with your family probably is not a good idea. She may show some excitement at going for a walk but after a few minutes she might not tolerate the costume, trick or treating, and the whole routine. Some pets just hate having anything on them and if that’s the problem, it’s not worth forcing them to wear something or making a tired old dog go out for hours when they’d rather stay home and nap. Before the big night of trick or treating, do a test run with the costume. Get her dressed up and see how long she wears it without fidgeting. You want to make sure the costume doesn’t restrict her or have elastic that is too tight on her body. Praise her for wearing it and see if she is ok doing her usual stuff in costume. This may mean you have a few test runs before trick or treating. Some pets don’t mind being in a crowded area or walking down streets that have a lot of people. Others might enjoy it too much and try to make new friends with everyone they meet. Then there the dogs that get nervous and might try to dart away. If your pet isn’t the type that handles social situations well, leave her home. 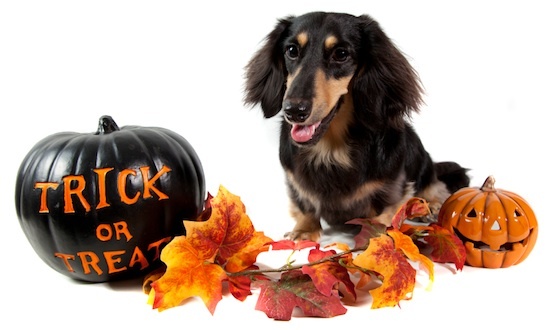 Remember that candy and chocolate can be toxic to your pet. No candy, candy wrappers, or anything that isn’t meant for them. Watch your pet to make sure they don’t get into the halloween candy and nom on something they shouldn’t.